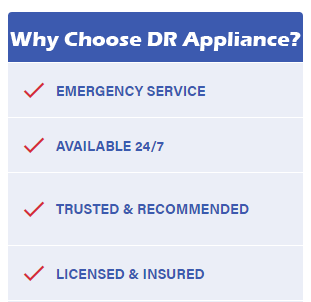 At DR Appliance, repairing and servicing various appliances is our specialty. So get in touch with our team whether your appliances are for home or commercial use. We are open 24/7 and over the holidays and weekends as well; also we don't charge extra if our clients need the work done as soon as possible. The summer months always make homeowners remember the importance of their air conditioning systems. Offices aren't also left out. Due to overworking and lack of maintenance, AC units may become defective and require maintenance. If it occurs during the summer period, it may become a nightmare. When the weather is unfriendly, it is great to know an Aventura Appliance repair service technician who can come to your business or home to get your air conditioning system running in very a short time. When our expert technicians come to your business or home, they will work swiftly, but efficiently and listen to all your demands and answer all your questions. You can keep your family as well as your guests comfortable inside your home, and keep your clients comfortable in your office with an air conditioner serviced by expert technicians. It does not matter if the washer doesn't spin or drain the water; our skilled technicians can quickly diagnose the problem and fix it in no time. You will need emergency repairs if you notice your washer makes a cracking sound, and the water inside starts pouring out. Our technicians will recommend how you use the washer to prevent any future breakages; also they will give you the situation report to allow you make an informed decision. All our service technicians work near where you live, and this means you will receive needed. If your dishwasher is leaking water and dishes come back out dirty, call our Aventura Appliance Repair company to put an end to the frustration. Our highly qualified technicians can tell you why your dishwasher is showing an error code within a short while; also they will bring all necessary spare parts to get the dishwasher working properly. If the dishwasher continuously breaks down or perhaps you purchased an unreliable dishwasher machine, call DR Appliance. For about a long time, DR Appliance has given clients the best appliance service around the Aventura area and has revived defective dishwashers and made them better than ever. If your dishwasher isn't working properly, call us. Tell our technicians what the problem is and they will fix it for you. There isn't a problem they can't solve, and when the dishwasher is fixed, you can begin to use your dishwasher once more. Some of the specific brands that our company works on include Samsung, LG, Maytag, and more. A lot of the clients who have worked with us have had a positive experience with our services. The charge to repair your dishwasher is affordable, we have nothing to hide from our customers, there aren't any hidden fees that sneak out of nowhere, it's very direct process, and you will be offered honest repair service. If your fridge has issues or is malfunctioning, you need to fix it as soon as possible. Furthermore, it is necessary to have the fridge checked by a technician immediately if it begins to smell burnt and makes a loud bang; get in touch with our Aventura appliance repair service company. All our qualified technicians are well-trained to fix different refrigerator brands including MayTag, Bosch, Whirlpool, Kitchenaid, LG and Samsung and more. We are experienced in ensuring that the job is done properly. Our appliance repair experts have the requisite experience and are all licensed and insured to offer the best services. We offer a 100% satisfaction guaranteed along with warranty to ensure our clients of our services. DR Appliances will save you time and money. We aren't just another quick fix company; we want to work on your repairs so they can last and keep the unit running in an excellent condition. Building relationships with our customers is a part of our branding system. Building trust and showing our clients through experience that we truly value them as a customer is our foundation as DR Appliances. We can only offer the best services which are dependable, skilled and cost efficient that meet the immediate and long-term needs of our customer, because, without them, we will not have a business. Are you having issues with your dryer? Do you want some help in order to get your appliance working properly? Your dryer is very essential, and you must have it working suitably at every given time, and we intend to help you with this. Here, at DR Appliance, we want to remain the ones who can be relied on when our clients need help with their appliance repairs, which include their dryer repair needs. So if you notice that your clothes come out wet after they have been placed in the dryer; have our technician look at it. In addition, your dryer may have a bigger problem if it takes a longer time to dry clothes or its door does not open. Contact us to take a look at it and have it back to a good working condition soon.